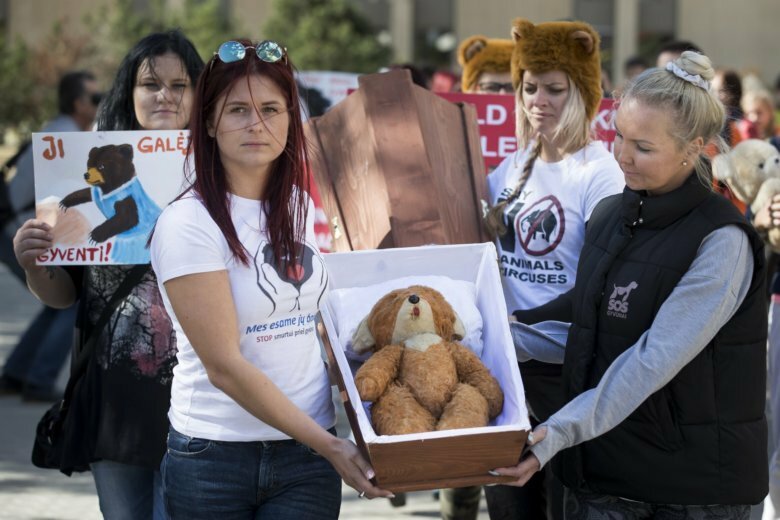 VILNIUS, Lithuania (AP) — Animal rights activists have staged a demonstration in front of Lithuania’s parliament to demand a ban on using wild animals in circuses after the reported death of a 6-month-old bear cub. The demonstrators carried a tiny coffin during a symbolic funeral on Sunday for the cub. Lithuanian news media have reported the bear died in captivity at a local circus during the summer. Several dozen participants brought teddy bears to the rally. More than 40 countries, including most European Union members, already outlaw the use of wild animals in circuses. Lithuanian lawmakers are expected to vote on a ban later this year.